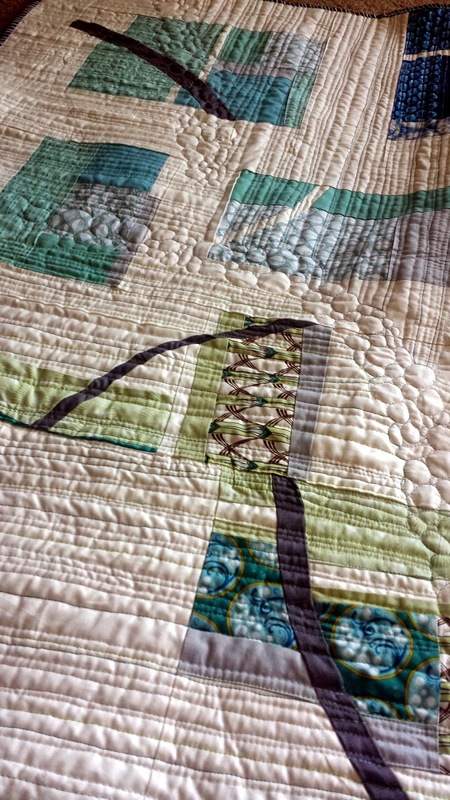 For this spring's Blogger's Quilt Festival, I'm sharing two quilts. The first is my most modern quilt (in my opinion): Pebble Cascade. I really didn't know where this project was going to go until it was already going. It has unexpectedly become one of my favorites ever, and it was both a real challenge and a real pleasure to make. 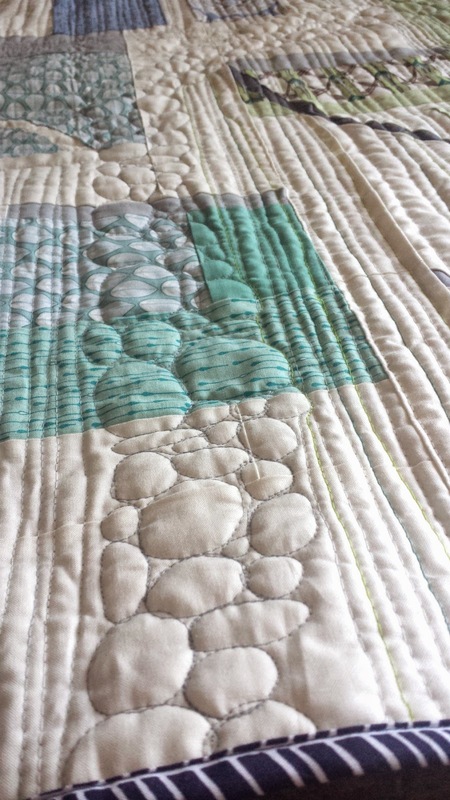 I made this quilt as part of the Cascade Fabric Challenge through Jessica Levitt and Windham Fabrics, and I'm honored that it won third place! "Pebble Cascade" was the first time I tried two key techniques: bias strip curve piecing and matchstick quilting. Now that it's finished, I look at this quilt to bring calm, zen, and peace to my life. To me, it evokes waterfalls and gardens full of flowers blooming. At one of my recent lectures, a quilter mentioned that she saw the curves as branches of the trees giving glimpses of the sky. That's the fun of improv - the message is in the eye of the beholder. My favorite part is the color gradation throughout the quilt, which was planned out. I pieced the blocks as scraps in an improvisational fashion, and gave myself a stipulation: include one piece of gray and one strip of white in each square. I was going to just sash the blocks, but I wanted to try some bias strip curved piecing (using a slash and insert technique). I'm so pleased with the outcome and I can't wait to try the technique again with more curves. I didn't try to match the blocks up again; it was easier and more interesting to let them end up where they ended up. The quilting was intense and easily the most time-consuming part of making the quilt. First, I started pebbling in curves on my home machine (using minimal marking - I just wanted them to mimic the curves in the quilt). The lines were created "organically" with my free motion quilting foot - they are not completely straight and I did not attempt to make them so. They are spaced irregularly and I used 7 different thread colors. I chose colors according to the section I was quilting. You can read even more about the process here, in my original post, and you might want to check out the tutorial and resources I wrote up for Sew Mama Sew earlier this week. The back - coordinating stash prints and some improv triangles to contrast the curves on the front! I'm entering this one into the Modern Category. I hope you enjoy seeing all of the beautiful quilts on display at Amy's Creative Side! I totally "get" waterfall from this too. I like the pebbles you added to the quilting. Do you have any good resources for the curved piecing with the bias strips? I have been so deep in this Banner Hell that I forgot it was Blogger's Quilt Festival this week...and then you posted and I was like, wut. Eff I am so behind on life. Anyway, I love your quilt and quilting and fabrics and layout...etc etc. Smooches. Hi Jess: You have a wonderful quilt. It is so peaceful to look at and yet new elements jump out every time. Good luck. I really like this quilt, from the piecing to the quilting, it all works so well together. Love your design. I especially like that you do not try to match the blocks after adding the curves. Love how you have added the branches and cascade of pebbles. Not to mention the colors are among my favorites! Great use of color and fabric, love the swirly bits. Great design. Love your quilt. It truly evokes calm with a bit of whimsy in the floating windblown "sticks". It's just stunning! 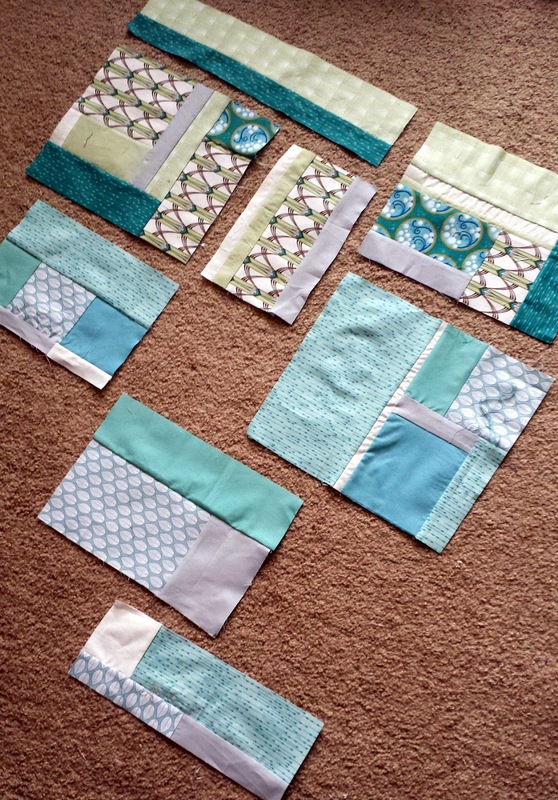 Your quilting is fantastic!! !